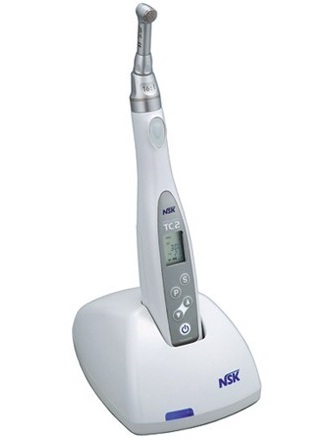 A large LCD, simple 5-key operation and a lightweight, cordless handpiece assure easy use even during the most delicate endodontic procedures. The Auto Reverse & Alarm Function alerts you with an audible sound to let you know that the load is about to reach the preset torque level allowing you to unload the file even before the Auto Reverse issetting in. 5 programs for different file systems. TC2 supports most major brands of Ni-Ti files. Click the button below to add the NSK Brasseler Dental Micromotor ENDO MATE TC2 Cordless to your wish list.